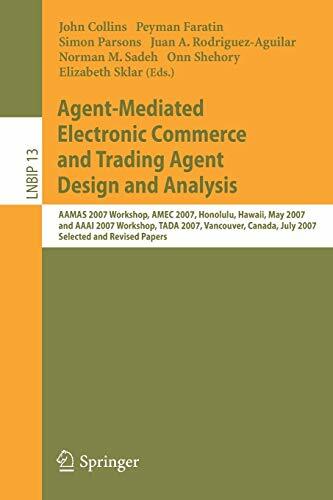 [PDF] Agent-Mediated Electronic Commerce and Trading Agent Design and Analysis: AAMAS 2007 Workshop, AMEC 2007, Honolulu, Hawaii, May 14, 2007, and AAAI ... Notes in Business Information Processing) | Free eBooks Download - EBOOKEE! Description: This book constitutes the thoroughly refereed post-conference proceedings of the 9th International Workshop on Agent-Mediated Electronic Commerce, AMEC IX, co-located with the Sixth International Joint Conference on Autonomous Agents and Multiagent Systems, AAMAS 2007, held in Honolulu, Hawai, in May 2007, and the 5th Workshop on Trading Agent Design and Analysis, TADA 2007, co-located with the Twenty-Second AAAI Conference on Artificial Intelligence, AAAI 2007, held in Vancouver, Canada, in July 2007. This volume presents 15 carefully revised and selected papers from these workshops. The primary and complementary goal of both workshops was to continue to bring together novel work from diverse fields on modeling, implementation and evaluation of computational trading institutions and/or agent strategies. The papers originating from AMEC focus on a large variety of issues on auctions, negotiation, and strategic behavior in electronic marketplaces. The papers originating from TADA reflect the effort of the community to design scenarios where trading agent designers and market designers can be pitched against one another. 2012-03-16Klaus Fischer, "Agent-Based Technologies and Applications for Enterprise Interoperability: International Workshops ATOP 2009, Budapest, Hungary, May 12, 2009, and ... Notes in Business Information Processing) "
No comments for "[PDF] Agent-Mediated Electronic Commerce and Trading Agent Design and Analysis: AAMAS 2007 Workshop, AMEC 2007, Honolulu, Hawaii, May 14, 2007, and AAAI ... Notes in Business Information Processing)".